All the skill, all the patience and all the time in the world will only get you so far with finely detailed carvings if you don’t have the right tools. The tools don’t need to be expensive ones or even specialised ceramics tools, but you do need to be comfortable with them and know exactly how they interact with the clay. When I first took pottery up in England after leaving it behind in Australia, I had one store-bought tool along with whatever I could cobble together from household items. This is a Thai Fruit Carving knife. Its distinguishing features are that it’s long, thin, sharp and relatively flexible. All of those are very useful features, although didn’t quite cover all of my needs so I was limited in what I could do for the first month until I acquired further knives of different shapes and flexibilities. * A flat vertical edge: This is one area my Thai knife fell down in. The bulk of the blade is completely straight but both sides taper at the tip, meaning I couldn’t get a clean 90 degree angle on the areas the designs lifted out of the background. It’s extremely important to get a clean edge that neither slants inwards (underhangs) nor buttresses outward from the piece. The former will make it impossible to take a good mould and the latter will look rough and poorly finished. The flat edge of a sharp knife, held completely vertically at a consistent height and rubbed with a decent amount of force against a rough edge of clay is one of the easiest ways to clean it up. * Sharpness of the edge: Many of your tools will naturally sharpen as you use them but it does help to have a little bit to start with. When wet, cutting through the clay with a dull blade will cause it to pull and bunch up ahead of the knife, and may tear off top edges of sections you wanted to remain if you’re working in a particularly intricate area. And when dry you’ll find you need far more pressure to shave the clay down if the blade is blunt, possibly risking snapping off pieces in the process. Of course, the flip side is that you can much more easily make a mistake with a sharp blade and have it cut deeper than you intended, so something in the middle may be best to begin with. * A long blade: It’s very useful to have at least one knife with a long blade but a nightmare if that’s all you’ve got to work with when you come to the detailing, so you’re really going to want a couple of different lengths. When I had only the Thai Fruit Carving Knife (with its two plus inches of bare blade) I was having to hold it pencil-like by the blade itself for several jobs. Even after I developed a substantial callous on my ring finger where the edge was pressing in it was still very painful after about an hour of work. Finding a smaller knife saved me from that trifling torture, but I still make frequent use the long blade with a job for which the others just don’t cut it (forgive the pun). The long blade should become your ‘go to’ tool when it comes to the background, both when the clay’s wet and when it’s dry. Ideally you should be removing the bulk of the background when the clay is somewhere between wet and dry, known as ‘leather hard’. With a long smooth blade and the natural consistency of the clay at this stage, you should be able to take the excess clay away in the same manner as skinning an animal (a macabre analogy, perhaps, but it’s a disturbingly close parallel). And when dry the same blade can be dragged at an angle, much like a shaving razor, to slice off any uneven bumps in the background. Trying to smooth off a large area with a smaller knife or loop tool (see my article on other tools) is going to leave undesirable cut marks all over the background, whereas a long blade can keep it at a uniform height. * Flexibility: As with the other features you’ll probably end up wanting knives that cover all options, although in terms of starting out I’d recommend leaning towards less flexibility rather than more. A firm blade will give you a good feel for the tolerances of the clay under the various pressures and angles you choose to use, and you also have to use less strength to make an impression. I would, however, suggest that you choose a blade with some amount of flexibility rather than one that’s completely rigid. I find fully inflexible blades difficult to work with because I like the blade to move with me, to bend slightly as if it were an extension of myself – we’re used to there being a little bit of give in our sense of touch. But that’s just my peculiarity. In terms of practicalities a fully inflexible blade gives very little room for error if you push too hard – the edge you’re pushing against will crack. Whereas a small amount of flexibility will act like a shock-absorber and allow you to get a good feel for the clay and how much pressure is required to carve it. A much more flexible blade shouldn’t be overlooked but I consider them to be more of a precision tool for advanced use. A flexible blade has good movement and a lot can be done with it if you know what you’re doing, but you have to be very sure that you understand the precise capabilities of the knife and the tolerance of the clay to the different types of pressure. You can easily find yourself pushing too hard and the knife pressing into areas at angles you never intended. 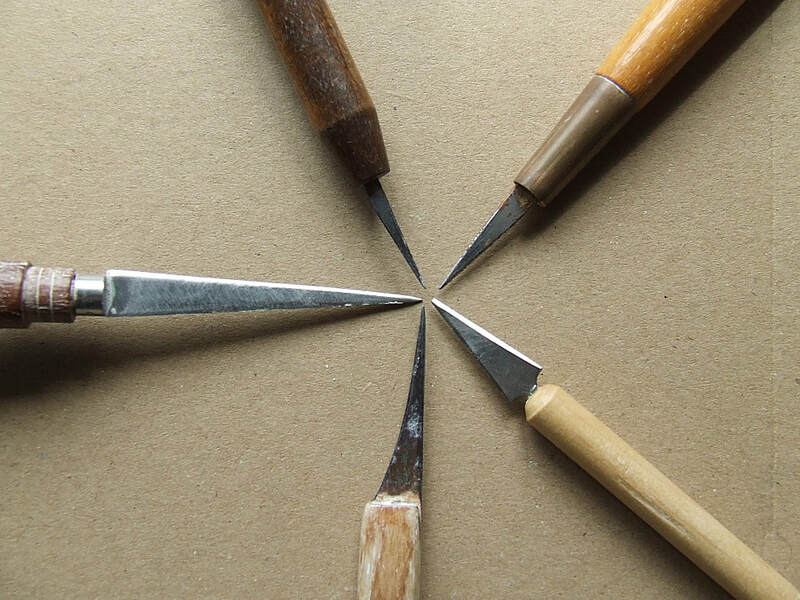 * A finely pointed tip: A thin tip is essential for detailed work, don’t settle for anything ponderously wide – you won’t be able to get a nice, crisp design from it. The sharper the better, although keep in mind that very fine tips will wear out more quickly unless your knife is made from very good quality metal. Several of my knives are handmade to my specifications from an old banding saw blade, but you may be out of luck getting something similar if you don’t know anyone who can turn a sheet of tough steel into useful splinters. The quality and density of the metal is extremely important when you’re going for a very fine tip. The thinner the metal the more flexible it is, generally, but in this instance you really don’t want it too bendable because it will make incising specific details much more difficult, ‘wobbling’ on the surface when you’re trying to engrave a straight line. In saying all that, I have one knife with a specifically blunt tip, shown in the photos above. I've found this one to be particularly useful to use not as a knife, but instead as a scraper to smooth off the background in areas that other tools such as the ribbon loop tool simply can't reach. This knife is often found as part of a modelling set, with several of the other tools coming in useful for odd jobs. In summary, I think that any serious potter that carves detailed work should have a wide range of knives that cover all different shapes, thicknesses and flexibilities. However, for a new artist starting out on a budget, I would suggest a long, sharp blade with one completely vertical edge, fairly firm in feel but with a small amount of give, and as fine a tip as possible.